Shopping for Disney Princesses Games? It's the Fast-Dealing Property Trading Game featuring Disney Princess! In this edition of the Monopoly game, each player chooses to play as an adventurous Disney Princess character. Then they build up their magical kingdoms by traveling around the board and buying properties along the way. Kids can buy up spaces like Mulan's Shan-Yu School, Jasmine's Magic Carpet Ride, Merida's Archery Lessons, and other Disney Princess properties. When all properties are bought, the player with the most owned properties wins! If there is a tie, then the player with most money will take the crown! 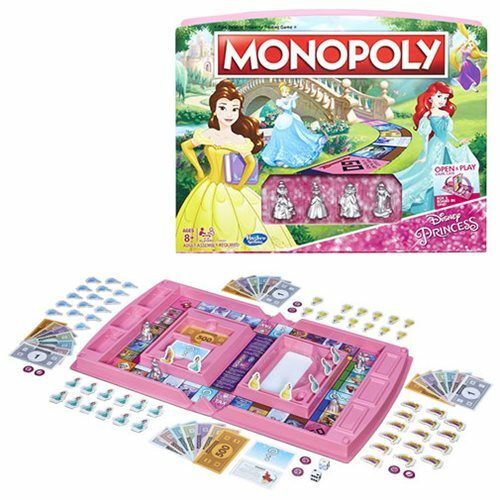 Includes gameboard, 4 Disney Princess tokens, 64 cardboard Princess markers (16 for each), 8 cardboard special tokens, 16 Chance cards, money pack, 2 dice, and game guide. Each token measures approximately 1 3/4-inches tall. For ages 8 and up. 2-4 players.